Detailed Risk Assessments and Method Statements (RaMS) are provided for each contract carried out. It is our company policy to maintain a safe and healthy working environment for all our employees, our clients and anyone affected by our operational activities. 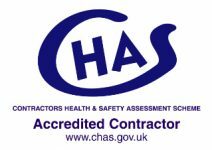 We are a CHAS accredited contractor showing our commitment providing the highest standards of Health and Safety. We are an Achilles UVDB Audit Verified contractor. We also invest in high levels of health and safety training establishing our commitment to quality and health and safety. DNA never stand still, we believe the road to quality has no ending. We continually strive to improve installation quality and processes.